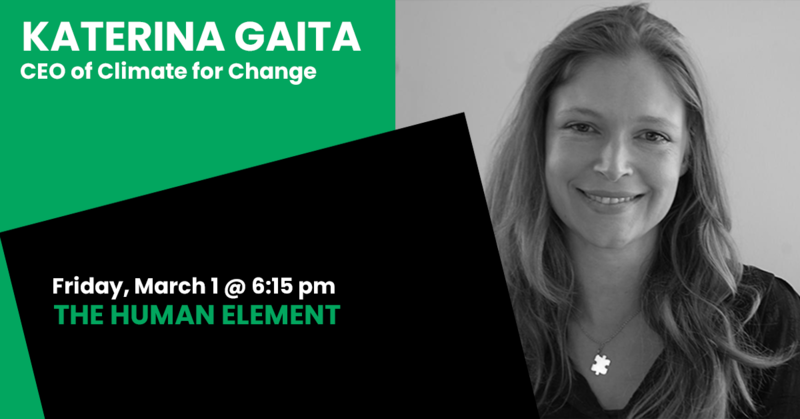 Katerina Gaita is the founder and CEO of Climate for Change, a not-for-profit working to create the social climate in Australia for the action we need on climate change. Climate for Change focuses on supporting those who do understand the scale and urgency of solutions needed to have more effective conversations with people around them who do not. Over the past 2 and a half years, Climate for Change has engaged 6000 people in face to face conversations about climate change. Previously Katerina worked with Environment Victoria and ran a sustainable living business. She has trained with Al Gore, Dough McKenzie-Mohr and many other experts climate communication and behaviour change. She is a Centre for Sustainable Leadership Fellow and an Advisory Board Member of Melbourne Sustainable Society Institute. Prior to pursuing her passion in sustainability and environment, Katerina studied and worked in the field of law, working as an assistant to Amicus Curiae in the prosecution of Slobodan Milosevic, Professor Tim McCormack and as a researcher at the Intellectual Property Research Institute of Australia (IPRIA). Katerina is also the mother of two boys, Mischa and Jasper for whom she does what she does.